Manufacturer of a wide range of products which include decorative trim, fancy jacquard lace (trim), parsi lace 03, new parsi lace 04, fancy embroidered lace (trim) and decorative jacquard lace (trim). Our presented range of Decorative Trims delivers fine look to the interior of the building. Having perfect thickness all our trims are user friendly and resistant to crack. 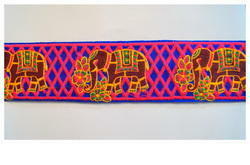 These trims are precisely framed and available in market in different colors. Customers have praised these trims for longer life functioning and easy washing. Moreover, these are safe to any chemical effect. We have emerged as a most renowned manufacturer of superior quality Trims. Being extensive and exhaustive, our range of Trims can easily enhance the grace & beauty of any apparel or home furnishing item. Clients can avail these Trims from us at the most cost-effective prices in the market. 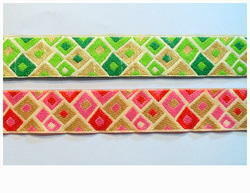 We are one of the leading manufacturer and supplier of Parsi Lace 03. We obligated to meet the quality standards as per the customer demand. We are successfully meeting the varied requirements of our clients by providing the best quality range of Fancy Embroidered Laces. With immense experience in this domain, we are engaged in offering an excellent collection of Parsi Multi Embroidery Lace. The fabric used in designing this lace is procured from the authentic vendors and guaranteed of its quality.